Are you in the market for a device that breathes productivity and portability at the same time? O+ USA intros the O+ DUO tablet that runs in both Windows 10 and Android 5.1 Lollipop. O+ USA has spotted a space for a productivity-based portable mini tablet. The O+ Duo shapes up to be a promising slate for those who wanted portability without sacrificing productivity. The slate could boot in either Android 5.1 Lollipop and Windows 10 operating system making it one of the first devices in the country with dual OS. The O+ Duo comes with an asking price of Php 6,995. On paper, the device is a great deal for the output-oriented use; moreover, the tablet shapes up to be a great data consumption device with its 8-inch form factor. 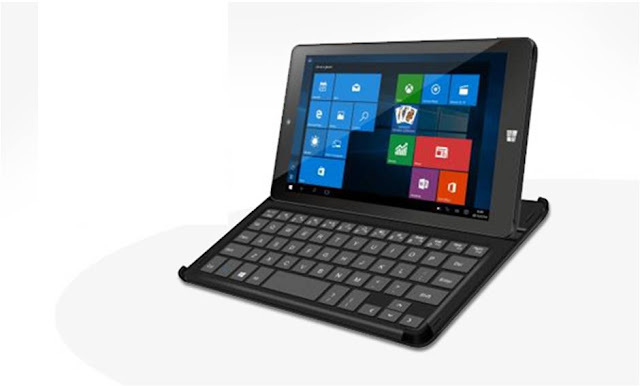 Likewise, O+ USA also includes a keyboard dock that serves as a cover for the tablet. For the specs-oriented, the O+ Duo churns with an Intel Atom Z3735F Baytrail that includes 1.3GHz quad-core processor. Plus, the addition of the 2GB of RAM makes it more appealing to on-the-go content makers. There’s also 64GB internal storage with expansion option (16GB goes to Android and the rest is for Windows 10 allocation). In terms of display, the O+ Duo also comes with a capable panel. It actually packs an IPS display with 1280 x 800 pixels. On the front, a VGA camera is a good tool for video calling; while the back panel comes with a 2MP shooter. Powering the whole hardware is the 4200 mAh battery that promises up to 8 hours of usage. O+ USA also included several ports like microHDMI for users to connect the slate to a larger display, microUSB and 3.5mm audio jack.